Since the late 1990s, corn gluten meal has attracted attention as a possible organic herbicide and weed suppressant, especially for lawns. It's a byproduct of processing corn for starch, oil, syrup and ethanol. A different corn gluten product, corn gluten feed, is used to feed livestock. Gluten is found in most cereal grains, and differs in makeup from grain to grain. These corn gluten products shouldn't be confused with the cornmeal used for cooking, which is ground whole corn. Since it was patented for herbicide use by Iowa State University scientist Dr. Nick Christians, corn gluten meal has been tried in different parts of the country, especially on lawns for weed control. It works by preventing seedling root growth, which makes the seedlings susceptible to drying out. It's only effective against certain weed species and when seeds are germinating, so application time is critical. Corn gluten meal isn't effective against weeds that are already established. The recommended lawn application rate is between 20 and 40 pounds per 1,000 square feet, and repeated applications are needed. Although it's effective in parts of the Midwest, it isn't effective in other areas, including the western U.S. Corn gluten meal is relatively expensive. Corn gluten meal contains 10 percent nitrogen, so it has potential as a fertilizer. In unfertilized lawns where it has been applied as an herbicide, it can green up the lawn. In areas where it's not effective as a weed suppressant, it can benefit weeds by nourishing them. For lawn fertilizer, use 10 pounds of corn meal gluten for every 1,000 square feet, applied in early spring. The cost is high in comparison to other fertilizers. Corn gluten meal is also suitable for fertilizing flower gardens and shrubs. 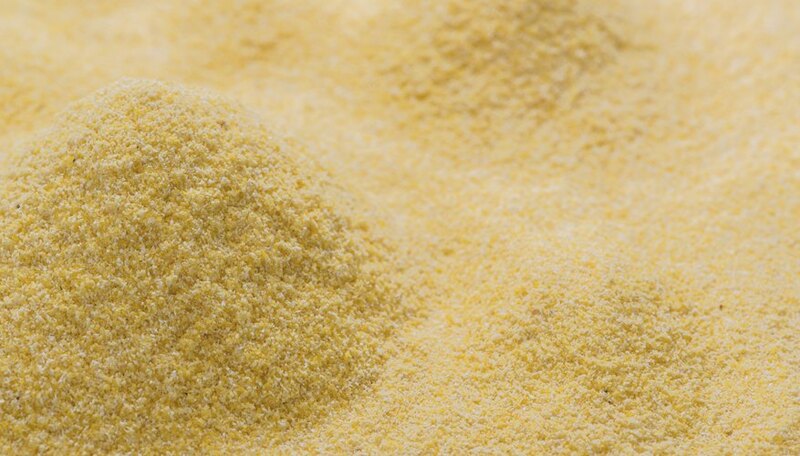 Corn gluten meal generally comes in a yellow to light brown granular or pelletized form that can be applied with a spreader. A liquid hydrolysate of corn gluten is also available that gives somewhat better weed control. It has the same issues as solid corn meal gluten in regards to application timing, ineffectiveness in some geographical locations and having a high relative cost. Corn gluten meal binds and holds water to help maintain soil moisture, but is more expensive for this purpose than a traditional organic mulches. Some people can develop sensitivity to corn gluten meal, and can have respiratory and hypersensitivity issues. If you have this, don't use corn gluten meal. Do not try to substitute corn gluten meal with corn gluten feed, which has different properties. Corn gluten products come off during the wet milling corn refining process. After soaking, steeping and separation, corn gluten meal comes off after starch separation and contains about 60 percent crude protein. Corn gluten feed comes off with the bran, containing about 20 percent crude protein. Corn gluten includes proteins called zeins and prolamins. Some people sensitive to wheat gluten may also be sensitive to some elements of corn gluten. Washington State University Extension: The Myth of Weed-Killing Gluten: "Corn Meal Gluten Is an Effective Organic Herbicide"